If you want some instructions on how to cross compile your pi kernel then this blog post will hopefully still be of some use! My journey started when I received delivery of my shiny new pi case and LCD display / touch screen. I eagerly followed the instructions supplied by Tontec (https://s3.amazonaws.com/ttbox/35screen.zip ) and got the LCD display working quite quickly but was disappointed with the results. The driver that they supplied technically worked but used almost all the CPU on the pi and was in effect useless. One word of warning was that the first time I tried to use the supplied driver I had my pi over clocked to 1000 Mhz and the display would not work. A helpful person on the raspberry pi forum had had a similar problem. Switching off the over clocking fixed the issue. I can overclock my pi to 950 Mhz and the display works without issue. I suggest that you start with a pi that has not been over clocked and then step up the over clocking once you have it working. I did some more research mostly on the raspberry pi official forums and found that this was a problem experienced by everyone that has purchased this and other similar displays. An open source frame buffer driver framework FBTFT had been created (https://github.com/notro/fbtft/wiki) by an enterprising pi user named notro. I was initially excited to see that it looked like the Tontec display uses a compatible display controller so I started trying to get the display to work using this framework. I learnt a lot on this journey using the information on the wiki but did not manage to get the display to work. I then sent an email to Tontec asking if they had a solution and was impressed with how quickly they responded. It seems that they has been working on improving their open source driver and they were using the excellent FBTFT framework. They provided me with the following download links. The above links are links to raspberry pi raspberry SD card images. If you want to create a pi sd card from this image then follow the instructions from the raspberry pi website http://www.raspberrypi.org/documentation/installation/installing-images/README.md. By this point I had spent a lot of time reading the documentation on the FBTFT wiki and fancied teaching myself how to re-compile the raspberry pi kernel and see if I could compile my own kernel with support for the Tontec display. I again contacted Tontec to ask for the source code that they had used to create there custom images. Again I was amazed at how quickly they responded and supplied me with the source code. I was successful in re-compiling the raspberry pi kernel and getting the display to work with the newly compiled kernel. I initially tired to compile directly on the raspberry pi but it takes 9 hours on the pi so I quickly decided to build a cross compile virtual machine and compile the kernel on that. Below are the notes that I made teaching myself how to compile the raspberry pi kernel with the FBTFT drivers using the latest raspberian image at the time of writing (October 2014). I used the following sites as my reference, so I would suggest that you also take a look at these sites. 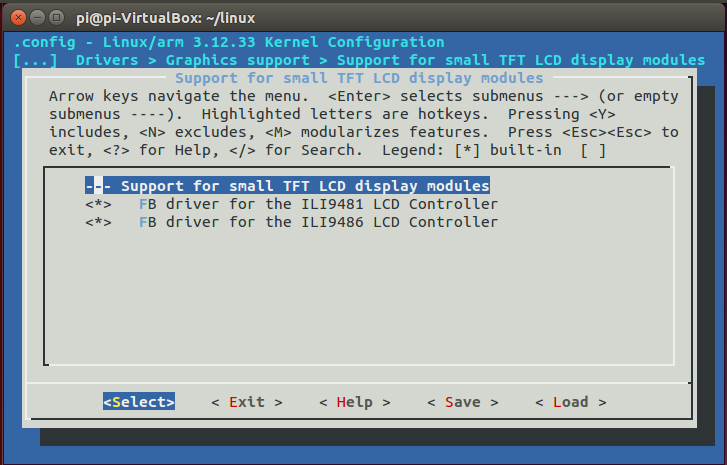 You can use the procedure below if you want to build a raspberry kernel that will allow you to see the pi boot on the TFT display. I used an Ubuntu virtual machine running on my windows laptop to cross compile the kernel. Make the hard disk 16GB as the default 8GB is not quite big enough for job. Boot the virtual machine from the Ubuntu image that you downloaded. Follow the instructions and install Ubuntu desktop. I installed with a named user of pi. on the desktop side bar and typing “terminal” in to the search bar. 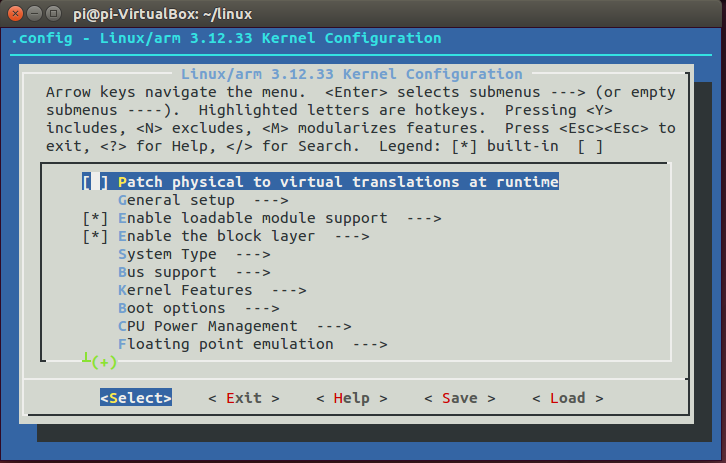 Once the terminal is open enter the commands in the boxes below to install the virtual machine add-ons. 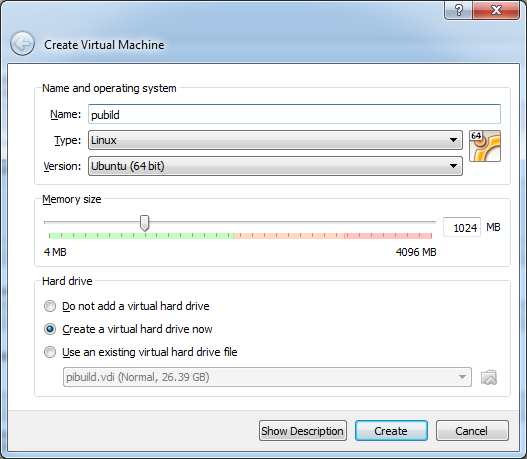 Once the add-ons are installed it will be helpful to allow you to copy and paste between your virtual machine and your host machine. This is configured from the devices menu and the shared clipboard sub menu located at the top of the virtual machine console window. Set the following environment variables by adding the following lines to the .bashrc hidden file in your home directory. This file is executed when you start a bash shell and so ensures that the environment variables are set that are needed for the compilation. Close the terminal window and re-open to start a new shell with the environment variables set. Next we need to modify the bcm2708 platform file. (A modified copy can be found in $HOME/mztx-fbtft) The file is located arch/arm/mach-bcm2708/bcm2708.c relative to where you installed the kernel source. So if you followed my instructions use the following command to edit the bcm2708.c platform file. Now it’s time to start the kernel build process. On my i7 4 core laptop giving 3 cores and half my ram (2GB) to the virtual box VM the kernel compile takes 20 to 30 mins which is a lot better than about 9 hours it takes on the pi. and then the following on the build machine to copy the config file to the root of the kernel source code. and most likely a few more. Answer y to the FB_TFT questions as shown above. If it asks for lots the most likely you have not copied in the kernel from the running pi. If menuconfiug runs the following will be displayed. Arrow down to “Support for small TFT LCD display modules (NEW) and it should already be selected with a star. The hit enter and check the ILI9481 and/or the ILI9486 are selected. Exit menuconfig opting to save the changes to the configuration file. 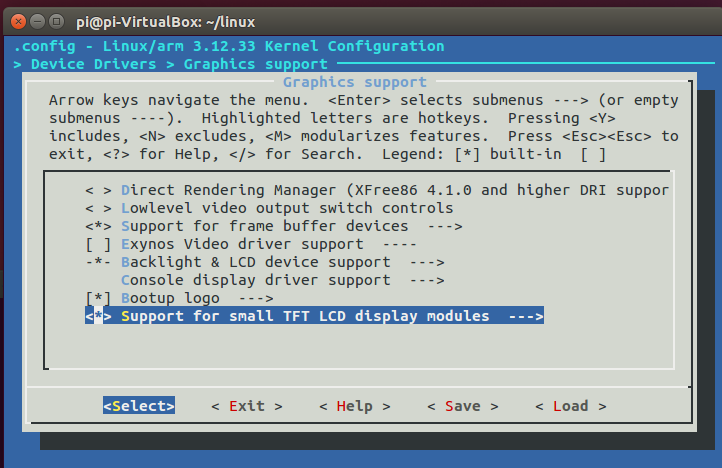 Download the firmware to match you kernel source. This takes a while depending on your internet connection speed. Now we have everything we need to boot the new kernel on the pi. We use scp to transfer files from the build machine to the pi users home directory, then log into the pi and install the files, reboot it and cross our fingers. depending on the date on your board. Now it’s time to log into the pi and install the kernel and firmware. I found the default console font a little hard to read so followed the instructions at https://learn.adafruit.com/adafruit-pitft-28-inch-resistive-touchscreen-display-raspberry-pi/using-the-console to select a better console font. My next project is to try to compile support for the touch screen component of the display, and see if I can incorporate the Tontec changes to the official FBTFT source so that the display can be used with the pre-build images available for download on the FBTFT wiki. If any one has any ideas on how to do this please fell free to comment below.